I really enjoyed my time off over the festive season, but I must admit it’s good to be back. We ended 2014 on a high, but I wouldn’t blame you for missing out on some of our last articles of the year. Just like this amazing competition, where there are no less than five big prizes up for grabs! If you haven’t yet heard, there’s a pretty awesome Trials-esque game launching locally called O3DX, and the cool team behind the game have chosen you, the Lazygamer community, to be part of their massive competition. 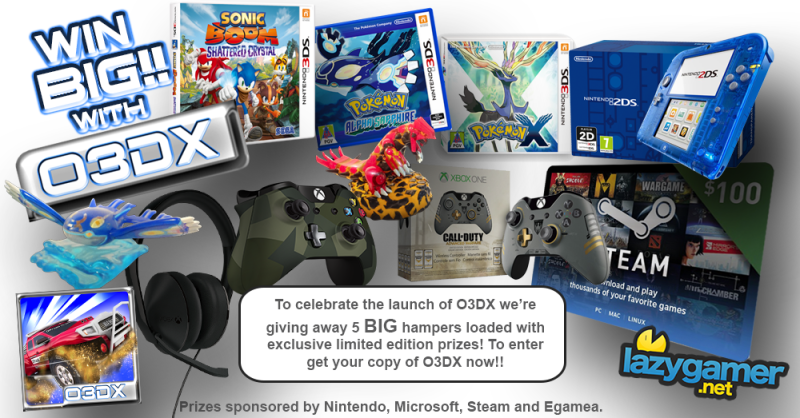 There’s some huge prizes on offer, including a Nintendo 2DS bundle, Xbox One accessories and even some Steam credit, all of which you can check out over here. If you’re sold already, then here’s how you can get in on some of this action. To lock in an entry, you’ll need to purchase O3DX, which is even easier with this 50% off code (GimmeLazyO3DX) that’s available exclusively to you. Make sure to fill out this form to be redirected to a purchase page, where you’ll also be automatically entered into the competition. If you’ve already purchased the game rest assured that your name is in the hat. The competition closes on the 12th of January, so act fast if you want to be in the running for one of the many prizes on offer. Also feel free to give O3DX some love on Steam Greenlight. Local is lekker!